Distilled’s Big PPC Competition: Use Your Ad Powers For Good! Right folks- it's competition time! Premise: we want to do something to mark the launch of our brand spanking new suite of PPC tools. We also want to do our bit to help out with the Myanmar (Burma) cyclone appeal, and thought the best way we could do this would be to play to one of our strengths. We're referring, of course, to the exciting world of PPC advertising. You (yes, you) write a blog post about the competition and include your ad in the copy- you should link to it in our comments so we know you want to enter. The purpose of your post is to spread the word about the Myanmar (Burma) cyclone appeal- there's no need to link to our blog (unless you really really want to!). To reiterate: over and above the actual ad campaign, your blog will help raise awareness. 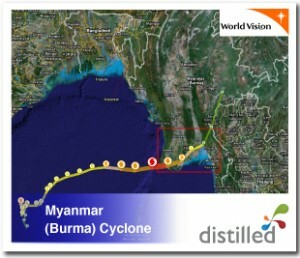 We'll put all the ad entries into a campaign with the Myanmar (Burma) cyclone donation page on World Vision as the landing page- deadline is Friday 13th June. We're putting up the budget to run the PPC campaign for a limited time. Obviously the longer we can run the campaign the better as it will lead to more donations (and more statistical significance for the adverts!). So if anyone is interested in contributing to the PPC budget please get in touch. The ad that performs the best and drives the most amount of traffic wins. - A year signed up to our Reputation Monitor tool, pro level. - 3 months premium membership with the one and only SEOmoz. This prize was kindly donated by SEOmoz (which means we can spend more on the ad campaign!) - A copy of Web Analytics: An Hour A Day By Avinash Kaushik - A Distilled hoody (limited edition) - 3 months free access to Acquisio Search and an Acquisio t-shirt from the nice guys at Acquisio - 3 months license to Ranksense from Hamlet Batista - A signed copy of Radically Transparent from Andy Beal - 2 year subscription to GoStat Pro from Richard at GoStats.com - We'll do a follow up post on you and your ad, explaining why we think it got to the top. Of course, you'll also be winning in the sense that any efforts you make should be helping to increase the amount of aid going to the cyclone victims in Myanmar (Burma). We're going to foot the bill for the PPC campaign for a short while. World Vision are a client of ours and we have arranged this one-off PPC campaign with them as a product of our team building day. All ads submitted will have to be run past them first. Using your common sense should be enough to make sure your ad passes muster. Once approved, your ad will be run from either Distilled or World Vision's Google Ads account. Ads need to follow the Google Ads format: 25 characters headline (1st line), 35 characters 2nd line, 35 characters 3rd line. You can submit up to three ads. However, we may have to limit the number depending on the take-up, so make sure you rank your submissions. The landing page you'll be sending traffic to is http://www.worldvision.org.uk/. That's it folks. Don't forget to leave a comment with a link to your post and the adverts you want to compete with. 3 month license of RankSense Professional from Hamlet Batista. Andy Beal has thrown in a signed copy of his book Radically Transparent. Signed! Cool. Richard from GoStats.com has given a 2 year Pro subscription.